Choose date and options above, then click "Reading" button. Dedicated to Lloydine (Bolon IK). Recorded by Starroot on White Solar Wind. Download free, right click to save. Dreamspell Tzolkin 260 Day Calendar- Same as the daily kin above and the 4 color Dreamspell wheel but from a different perspective. The Dreamspell starts at the upper left corner and counts from 1 to 260, it proceeds down the column until the column ends, then continues at the top of the next column. Kin number ranges at the top. This date in: Yellow Southern Castle of Giving. History of the Solar System from The "Mayan Factor"
Our solar system's orbit through the Milky Way takes the Earth through cyclical ages. The ages or baktuns are arranged in the image, a new golden age is forecast in the time of the now beginning Aquarian age. (17 of 1-20). Changes each day. Haab month changes to next month on day zero. Month number 18 has 5 days. 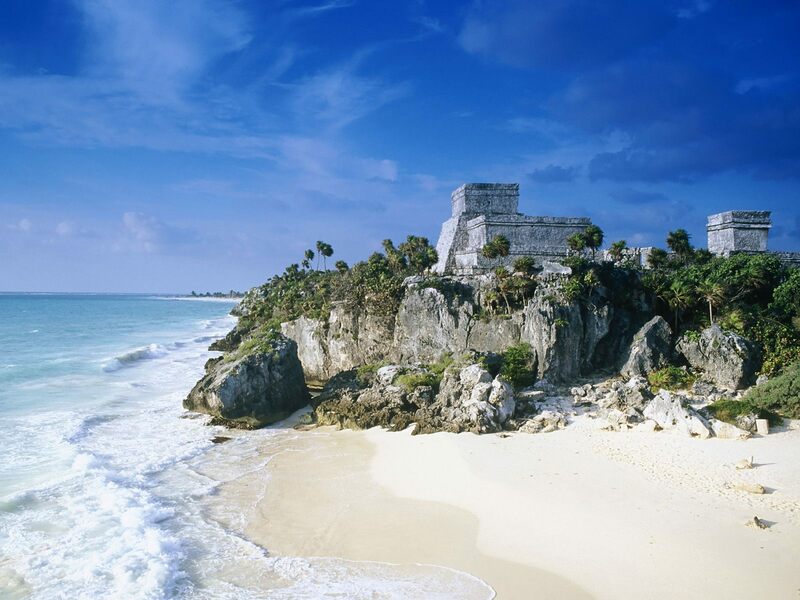 On December 21, 2012 the Mayan Long Count calendar will be 13.0.0.0.0 (Goodman, Martinez, Thompson calibration) . This is significant because it indicates a Earth orbit event that returns once every 26,000 years (precession of the equinoxes). the Galactic Alignment "zone" is 1998 +/- 18 years = 1980 - 2016. This is "era-2012". 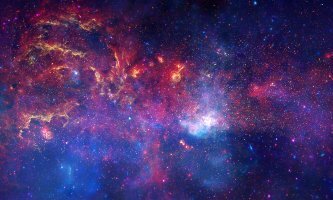 The composite image shows the Milky Way galaxy. The bright small spiral is the center of the galaxy. The alignment of the 2012 December solstice sun and the Dark Rift, which lies along the galactic equator, is the Mayan Long Count galactic alignment. In other words, on 12/21/2012 the Sun will rise pointing towards the Dark Rift center of the Galaxy. 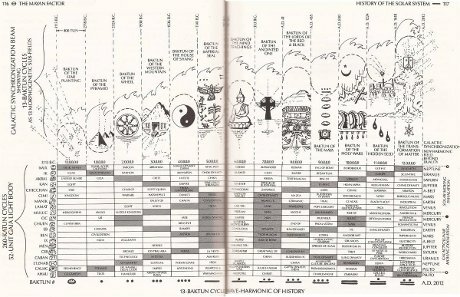 The Mayan Long Count includes stages that have "properties of time". The Galactic Alignment begins a new age based on the ancient history that the Mayans knew. Some say that this age is the "accelerated" time. Each day shows 13 Moon Calendar date. Dreamspell calendar date and glyphs. Step 1. Choose a date above within the desired 260 day (kin) range. Leave as today's date for the current planner. Step 3. Download the document images. Images within the Daykeeper are not embedded in the files, the images are stored separately on the hard drive. This only needs to be done once. Step 4. Unzip the image files. Click and run the file downloaded in step 3 (Daykeeper_images.exe), it is a self extracting zip file. This will automatically create the images in the correct folder. The Daykeeper_images.exe file is a executable and may require allowing it to run if Windows asks. Leave the image zip file "DKbmaps_Linux.zip" in the Downloads folder. Open a command terminal: Applications-Accessories-Terminal. this will ask for the root user password. Step 5. Download the Daykeeper document file. Step 6. Open the Daykeeper document file. If not already open, navigate to the download folder, click the "DayKeeper.rtf" file. The file should open using Word or Open Office. You should see the color images if properly set up. There must be 24 pages, 12 front plus 12 back. Delete spaces or adjust the margins if there are more than 24 pages. Rich Text format (.rtf) with color images. For use with many word processors. (Does NOT work with Wordpad). These instructions are for a desktop printer which prints on the back of the paper as to when fed into the printer. You may have to manually re-order each paper sheet order before printing the backs depending on your printer. Download the image archive and the Daykeeper rtf file above. Unzip the image archive and save the files in the locations specified for your operating system. The images need to be stored in the exact folders, the Daykeeper rtf file looks for the images there. The Daykeeper rtf file may be located anywhere. Test how to turn over the papers to print on the back. *Print page 1 then print page 13 on the back as a test. You may want to use black ink only during testing. Remember how the paper needs to be turned over. When you get that correct then print the entire planner. Print the entire day planner. ONLY USE 12 SHEETS OF PAPER. There are 12 pieces of paper used when printed on both sides. You may have to adjust the margins to work with your printer, but you need to end up with 24 pages in the Daykeeper rtf file. "DayKeeper.rtf" pages 1-12 are the front of the papers, "DayKeeper.rtf" pages 13-24 are the backs of the papers. Print the 12 front pages, turn the stack over, page one should be on top with the orientation so page 13 prints on the unprinted side, then put the stack in the printer again and on the backs of them, print the backs. After the first 12 pages are printed, you will have to turn the pages with the correct side up and with the correct side entering the printer first. You will have to adjust the sheets so that page 13 of DayKeeper goes on the back of page 1 of DayKeeper and so on. Make sure the orientation is the same, that is be careful that the tops are correct. Make sure the wavespell numbers are in order. The numbers are at the beginning of a wavespell:"Wizard wavespell (2)". Also the kin numbers must start at 1 and go to 260. Fold the day planner and staple on the crease. Use a long reach stapler or open a small stapler up and manually bend the staples or make holes in the crease and stitch. "How? through the use of the Dreamspell Oracle to arouse and reconstruct the memory of galactic time. By reconstructing the third-dimensional space suit, the human body, with its fourth-dimensional holon, galactic time is the direct revelation of the law of the kin. In the law of the kin, all kin are equal. It is for the planetary kin, equal and free, to create a path of power for the rainbow nation that is completely liberated of all institutions, money, war, poverty." From "The Mayan Factor, Path Beyond Technology" Dr. Argüelles. 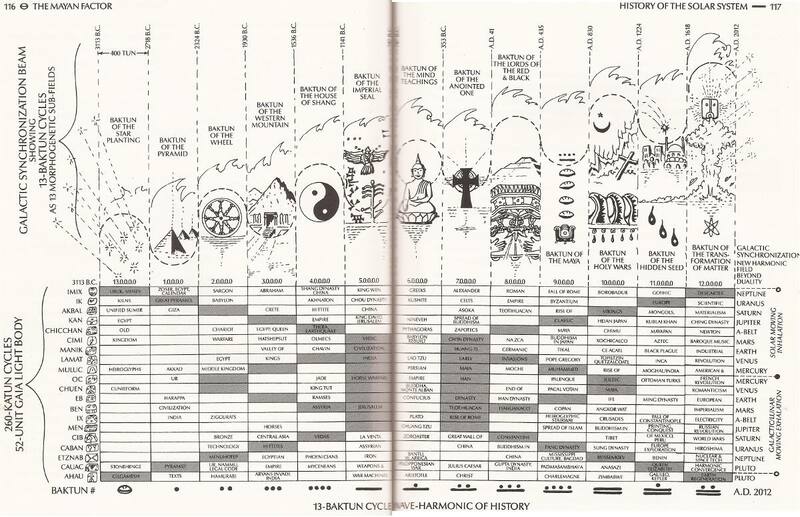 The Mayan Dreamspell calendar by Jose Argüelles is based on the Mayan Tzolkin Calendar - see the Dreamspell Tzolkin. Use the mouse tooltip for information, put the mouse pointer over an image without moving the mouse to see the popup. The Dreamspell Tzolkin grid is the Dreamspell calendar, choose options All or Dreamspell including Wheels to see the bottom of the page. 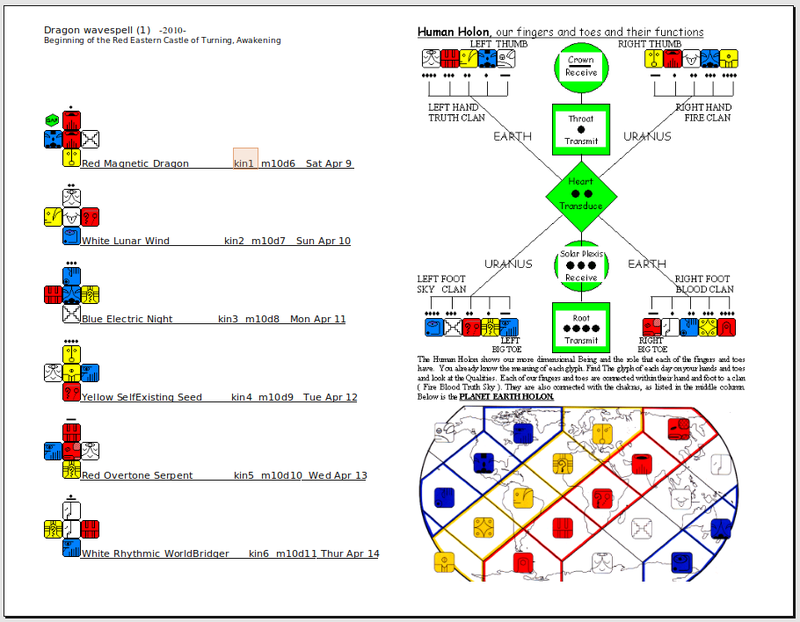 The Haab and Mayan Tzolkin is at the bottom when option all is used. Use the browser's View/Zoom setting so you can read the text. For an explanation of the long count, choose "long count" only with "wheels".